It’s National Tartan Day, which recognizes Scottish-Americans’ contributions to America. Tartan, familiar in Scottish kilts, is a pattern consisting of criss-crossed horizontal and vertical bands in multiple colors. Originally woven wool, it is now made in many other materials, and can even be found as wallpaper. Nineteen of the 56 delegates who signed the Declaration of Independence came to America from Scotland or were Ulster Scots, who had been living in Ireland. Others, like Thomas Jefferson, had Scottish ancestors. Today, more than 11 million Americans claim Scottish and Scotch-Irish roots, making them the eighth largest ethnic group in the U.S.
You don’t have to be of Scottish ancestry to celebrate. Our family celebrated every holiday that involved food), a tip for food-loving families. You can celebrate with traditional Scottish foods like haggis, Scottish pie (filled with ground mutton), smoked salmon or tatties (mashed potatoes) and herring. Or you can kick back at the end of the day with a glass of Scotch, or a Scotch cocktail. Chocolate with Scotch? Absolutely! Photo by László Rákoskerti | IST. Among the many options, you can replace the vodka in a Bloody Mary with Scotch, creating a Highland Mary a.k.a. Bloody Scotsman. But we suggest a Scotch and chocolate tasting. Not into Scotch and chocolate? 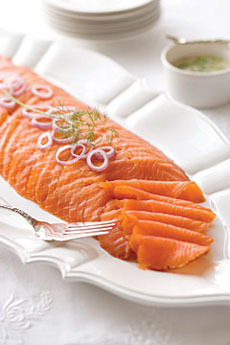 Celebrate National Tartan Day with an appetizer of Scottish smoked salmon. We like ours with a sprinkling of capers, some snipped fresh dill and a squeeze of lemon or lime. The onions are also welcome. Photo courtesy MackenzieLtd.com. Paiing chocolates with wine and spirits is even more enjoyable than drinking the Scotch—or eating the chocolates—by themselves. 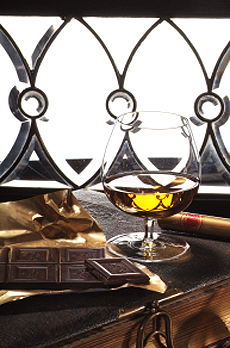 If you haven’t already seen our wine, spirits and chocolate pairing guide, take a look. While we like Scotch from all over Scotland—the flavors vary substantially due to the local water and microclimate—it’s easiest to pair chocolates that have flavor notes similar to the Scotch, for example, smoky, peaty Laphroaig single malt Scotch, paired with single-origin chocolates that have smoky notes. Here’s what you need to know to have your own party. Tartan is often called plaid in North America, but in Scotland, a plaid is a tartan cloth slung over the shoulder as a kilt accessory, or a plain ordinary blanket such as one would have on a bed. The best-known tartan patterns are the Black Watch and Royal Stewart. Until the mid-19th century, tartan designs were associated with regions or districts, rather than any specific Scottish clan. Tartan became popular throughout the English-speaking world after Queen Victoria expressed her fondness for all things Scottish. The world’s first color photograph was of a tartan ribbon. The English word tartan derives from the French tiretain, from the verb tirer which references woven cloth, as opposed to knitted cloth. The word plaid derives from the Scottish Gaelic plaide, meaning blanket. The word was first used to describe any rectangular garment, including tartan. In time, plaid was used to describe blankets themselves. A belted plaid is a blanket-like piece of fabric that is wrapped around the body with the material loosely gathered and secured at the waist by a belt. A portion of the fabric is wrapped up around the upper body and a portion hangs down to the knees (see it here). The belted plaid was a standard item of men’s Highland dress from the late 16th century until the middle of the 18th century, when it began to evolve into the modern tailored kilt.